A 10′ × 10′ digitized sky survey image centered on NGC 5927. North is up and east to the left. The green symbols show the location of the spatial distribution of the 7 stars analyzed. Credit: Mura-Guzman et al., 2017. (Phys.org)—Chilean researchers have presented a chemical study of the old, metal-rich globular cluster NGC 5927. The new research determines abundances of 22 elements in seven giant stars of the cluster. The findings are available in a paper published November 8 on the arXiv pre-print repository. Discovered in 1826, NGC 5927 is a globular cluster near the Galactic plane, located about 7,700 light years from the Earth. It is one of most metal-rich globular clusters in the Milky Way and has an estimated age of approximately 12.25 billion years. 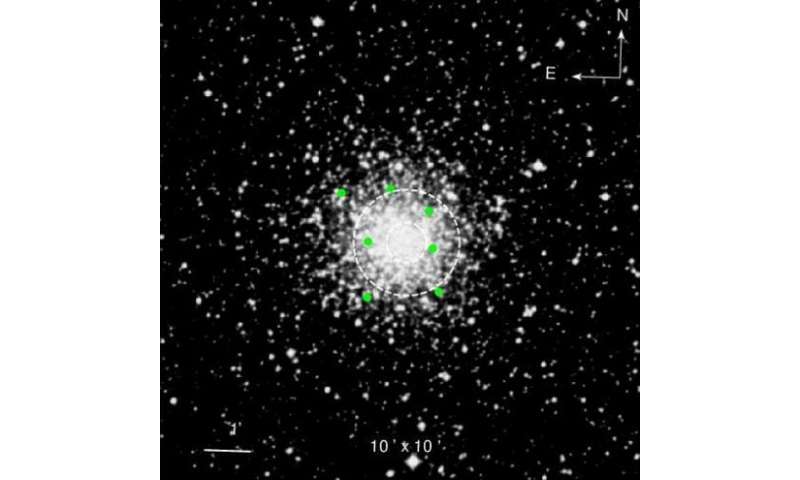 Galactic globular clusters, especially such old as NGC 5927, are important for astronomers since they are among the oldest objects in the universe. Therefore, they could serve as natural laboratories for the study of stellar evolution processes. In the case of NGC 5927, it is believed that it was formed during the earliest stages of the formation of the Milky Way. Hence, researchers hope that this cluster could provide essential information about how the initial material got processed chemically. A team of astronomers led by Aldo Mura-Guzman of the University of Concepción in Chile, has lately performed a chemical study of NGC 5927. They obtained high-resolution spectra using the FLAMES/UVES spectrograph at the UT2 telescope of the European Southern Observatory (ESO) in Chile, which allowed them to conduct a detailed chemical abundances analysis of this cluster. "In this paper we present a chemical study of the GC NGC 5927 based on high-resolution spectra taken from UVES," the authors wrote in the paper. The researchers determined chemical abundances 22 such as sodium, aluminum, iron, oxygen and heavy elements like yttrium and zirconium. They found that NGC 5927 hosts multiple stellar populations with oxygen-sodium anti-correlation, and moderate spread in aluminum abundances. According to the paper, NGC 5927 has a mean metallicity of –0.47 dex, what is consistent with previous studies. This value is comparable with field stars and globular clusters in the Milky Way's bulge. Moreover, the scientists noted that no significant spread in other iron-peak elements is visible in the studied cluster. Furthermore, the researchers confirmed a sodium-aluminum correlation but found no clear evidence for magnesium-aluminum anti-correlation in NGC 5927. The study also revealed that heavy s-process elements show no significant spread in this cluster. According to the authors of the paper, this seems to contradict the theory that asymptotic giant branch stars are polluters for the second generation stars. In concluding remarks, the researchers noted that NGC 5927 is similar the globular cluster NGC 6440 in the Milky Way's bulge when it comes to chemical composition. This suggests similar origins between these two clusters. "The chemical similarities of NGC 5927 with Bulge GCs and especially with NGC 6440, lead us to consider a formation scenario where NGC 5927 was formed from material in-between the Bulge and Disk, when both structures were still in formation," the scientists concluded. Globular Clusters (GCs) are natural laboratories where stellar and chemical evolution can be studied in detail. In addition, their chemical patterns and kinematics can tell us wich Galactic structure (Disk, Bulge, Halo or extragalactic) the cluster belongs to. NGC 5927 is one of most metal-rich GCs in the Galaxy and its kinematics links it to the Thick Disk. We present abundance analysis based on high resolution spectra of 7 giant stars. The data were obtained using FLAMES/UVES spectrograph mounted on UT2 telescope of the European Southern Observatory. The principal motivation of this work is to perform a wide and detailed chemical abundance analysis of the cluster and look for possible Multiple Populations (MPs). We determined stellar parameters and measured 22 elements corresponding to light (Na, Al), alpha (O, Mg, Si, Ca, Ti), iron-peak (Sc, V, Cr, Mn, Fe, Co, Ni, Cu, Zn) and heavy elements (Y, Zr, Ba, Ce, Nd, Eu). We found a mean iron content of [Fe/H]=-0.47 ±0.02 (error on the mean). We confirm the existence of MPs in this GC with an O-Na anti-correlation, and moderate spread in Al abundances. We estimate a mean [α/Fe]=0.25 ±0.08. Iron-peak elements shows no significant spread. The [Ba/Eu] ratios indicate a predominant contribution from SNeII for the formation of the cluster. As much as I ridicule the fantasy of alien inhabited worlds or habilitating dead worlds to sustain an Earth biosphere. This cluster is one of the best candidates we have to detect spacefaring aliens. Logically, they or their machines would develop space industries. This cluster has to be a very attractive possibility for any technological society. The planets of course would be extremely toxic to any biology. Your programmers better be the best coders available. Accessing these resources would be automated facilities. A large-scale operation might be detectable at this range. If our instrumentation continues to evolve. However, I'm guessing we will never detect any such industrialization. I think Earthlife is just too early in the time scale of this universe. And that any life, much less intelligent, will be rare and far between in time and space.